We’d love your help. Let us know what’s wrong with this preview of Once Upon a Town by Bob Greene. In search of "the best America there ever was," bestselling author and award-winning journalist Bob Greene finds it in a small Nebraska town few people pass through today—a town where Greene discovers the echoes of the most touching love story imaginable: a love story between a country and its sons. During World War II, American soldiers from every city and walk of life rol In search of "the best America there ever was," bestselling author and award-winning journalist Bob Greene finds it in a small Nebraska town few people pass through today—a town where Greene discovers the echoes of the most touching love story imaginable: a love story between a country and its sons. To ask other readers questions about Once Upon a Town, please sign up. I wanted to buy this book when it first came out, but didn't. Glad I didn't pay $22 for it. I found a copy at a book sale at the Cooperstown Library for 50 cents. The book is about a really fantastic community effort that took place in WWII - a small town in Nebraska that decided to meet troop trains that stopped in its town for only ten minutes each. So, they set up the North Platte, Nebraska, "Canteen." Along with a dozen other towns, some of them one hundred miles away, volunteers provided san I wanted to buy this book when it first came out, but didn't. Glad I didn't pay $22 for it. I found a copy at a book sale at the Cooperstown Library for 50 cents. Along with a dozen other towns, some of them one hundred miles away, volunteers provided sandwiches, fried chicken, homemade cakes, hard boiled eggs, cookies, music, cards and letters, and words of encouragement to these mostly young kids who were on their way to war. They served 6 million soldiers over a five year period, providing them with the only bright spot in their trips. What a tremendous story, right? However, there are two huge flaws in this book that made it a major disappointment to me. The first is that Bob Greene is more interested in blathering on and on with his own shallow observations about the character of North Platte (and by extension, small town America) and drawing rudimentary conclusions, using a maudlin, cloying, overly dramatic style, and repeating the same conclusions over and over again. The second flaw is that he's lazy. The actual interviews, newspaper story quotes, and description of the Canteen organization, the background about WWII rationing, and the entire context of the Canteen takes up about only about one-fourth of the book and his "observations" take up the rest. I skimmed most of the book, concentrating on the actual Canteen content, and finished it in about an hour. What makes me sad about this is that there will probably not be another book about the Canteen again, and the subject deserves far more serious investigation and true scholarship/reporting than Greene gave it. He just wasn't up to the task. To be honest, I felt as though he wrote this book to cash in on the WWII veterans who are quickly disappearing - that's how bad I thought it was. 3.5 stars. This was a great true story of the North Platte Canteen. 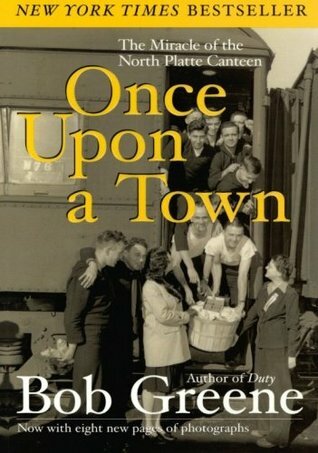 "Once Upon a Town" is the true story of the North Platte Canteen. What is that? Well, on December 25, 1941, just 18 days after Pearl Harbor, the women of North Platte realized that many troop trains were stopping through their Nebraska town crossing over to the Pacific side of the U.S. They decided to meet the servicemen on the trains for Christmas, because it was supposed to be Nebraska boys. It turned out to be Kansas servicemen, but it didn't matter, they gave them all of their Christmas gift "Once Upon a Town" is the true story of the North Platte Canteen. What is that? Well, on December 25, 1941, just 18 days after Pearl Harbor, the women of North Platte realized that many troop trains were stopping through their Nebraska town crossing over to the Pacific side of the U.S. They decided to meet the servicemen on the trains for Christmas, because it was supposed to be Nebraska boys. It turned out to be Kansas servicemen, but it didn't matter, they gave them all of their Christmas gifts and food anyway. They promptly decided that it was their responsibility to meet EVERY train at the depot, and for the next five years, at the rate of about 10-15 trains a day, they met and fed every serviceman that traveled through North Platte. Every one. Millions of soldiers. Many remember their brief 10-minute stop in North Platte to this day, and Bob Greene's book tells their story, and the story of those women who remember working in the Canteen. This book touched me in so many ways, that I am still wondering how Bob Greene managed to write such a wonderful book. This isn't just a story about World War II. It's a story about America, and what it was like on the home front for so many American women, and frankly, what it means to be American in the first place. In our muddy situation in Iraq, it was a breath of fresh air to listen to a different generation talk about the genuine responsibility they felt to the world, because they could do something to stop Hitler, and the Japanese advance, and they felt it was their obligation to do it. It is not enough in our day and age to say, "This is wrong, and we can stop it." Things get more complex, and it was wonderful to visit a time, even for a short while, when things were much more simple. The servicemen would cry when they talked about the Canteen, and what it meant to them. That short 10 minute period in their lives could bring tears to their eyes sixty years later. It brought plenty to mine too. The pure goodness and graciousness of the people of the North Platte area, and the sacrifices they made to make sure that those servicemen knew they were appreciated, and that they went to war knowing what they were fighting for, made an impact on the soldiers that gave them courage in times of doubt. One man commented that when they were sitting in foxholes in the South Pacific, they would talk about the delicious food and warm feelings they had for North Platte. It sustained them in their darkest hours. I was so proud to be an American, and a Mid-Western American at that, for the past few weeks, while reading this book. It is not often, in our busy lives, that one gets a chance to stop and think about patriotism, this book gave me the opportunity, and I relished every minute. I picked up this book because the place name North Platte seemed familiar to me. Finally, it dawned that we had stayed there overnight on our epic road trip from Crystal Lake, Illinois to San Francisco, California, and back in 2011. We traveled in a loop going through a total of twelve States. According to my blog, we had visited Henry Doorly Zoo in Omaha, Nebraska earlier that day in a sweltering 96ºF! Anyway, I digress. I truly thought this would be an interesting and heartwarming read about t I picked up this book because the place name North Platte seemed familiar to me. Finally, it dawned that we had stayed there overnight on our epic road trip from Crystal Lake, Illinois to San Francisco, California, and back in 2011. We traveled in a loop going through a total of twelve States. According to my blog, we had visited Henry Doorly Zoo in Omaha, Nebraska earlier that day in a sweltering 96ºF! Anyway, I digress. I truly thought this would be an interesting and heartwarming read about the warmth and generosity of human kindness, however, I didn't enjoy the author's style of writing. Instead of becoming immersed in the tale, I was always aware of the author's presence and his point of view. What a heart warming book this is! This is the story of North Platte, Nebraska during World War II. Troop trains enroute to their ultimate destinations in Europe and the Pacific pass through this small community daily. Every day of the year, every day of the war, the people who live there ban together to form the North Platte Canteen where homemade food, entertainment, and recognition is given to soldiers during their brief stop. Staffed and funded entirely by volunteers, by the end of the war, What a heart warming book this is! This is the story of North Platte, Nebraska during World War II. Troop trains enroute to their ultimate destinations in Europe and the Pacific pass through this small community daily. Every day of the year, every day of the war, the people who live there ban together to form the North Platte Canteen where homemade food, entertainment, and recognition is given to soldiers during their brief stop. Staffed and funded entirely by volunteers, by the end of the war, these people have served over 6 million soldiers and have done so by donating their own rationed food supplies and by manning the Canteen from 5:00 A.M. to midnight for over four years, never missing a day. Although I didn't find this book particularly well written, it is a book I would suggest to every friend. I think that it is a book that reminds the reader who we - many of the world's citizenry - once were. It is a story of sacrifice, of patriotism, of loving kindness. It is also a story of the tremendous difference individuals can make in the life/lives of others. I have already recommended the book and have begun the process of sharing my copy with as many friends as I am able. It was a monumental act of generosity that kept the North Platte Canteen in operation from 1941 to 1945, offering food, drink, and gratitude to the multitude of troop trains carrying young servicemen through Nebraska during WWII. Greene's book is a tribute to those who made it possible - a scrapbook of memories recalled by men and women who are now in their 70s, 80s and older. Through scores of interviews, he is able to capture again the excitement, the emotions, and the utter innocence of that p It was a monumental act of generosity that kept the North Platte Canteen in operation from 1941 to 1945, offering food, drink, and gratitude to the multitude of troop trains carrying young servicemen through Nebraska during WWII. Greene's book is a tribute to those who made it possible - a scrapbook of memories recalled by men and women who are now in their 70s, 80s and older. Through scores of interviews, he is able to capture again the excitement, the emotions, and the utter innocence of that place and time. Just 10-20 minutes - as men burst from the trains, were welcomed with home cooking and smiles, and then dashed back onboard again - are remembered 60 years later by men who have never forgotten and often dissolve into tears as they try to explain what it meant to them, no more than boys then, far from home and family. This is an amazing true-life account about one Mid Western town and its citizen's efforts to support military troops during the second world war. The account is largely based on memories recalled during personal interviews and by historical newspaper articles. I found this book to be heartbreaking and and the story was truly touching. The writing did seem to wander a bit, but the author does a good job of weaving together multiple eyewitness accounts with other elements of the story. While the m This is an amazing true-life account about one Mid Western town and its citizen's efforts to support military troops during the second world war. The account is largely based on memories recalled during personal interviews and by historical newspaper articles. While the main mission of the book is to provide a written history about a specific place and event, the author also tries to use the example of the North Platte Canteen to draw a parallel to today's time and place. He seems to find it ironic, and perhaps a bit sad, that nothing like the North Platte Canteen would ever exist today. Amazing! This was something I was completely clueless of. I had no idea what soldiers went through in the US before being shipped off to Europe, the Pacific or else where during WW2. I'm astounded by the sacrifice this community in Nebraska gave. It was a time when Americans were truely proud of their country and showed it through respect by giving their time resources and service to others. And in a time with rationing and all together a lot less. Some farm houses didn't even have electricity y Amazing! This was something I was completely clueless of. I had no idea what soldiers went through in the US before being shipped off to Europe, the Pacific or else where during WW2. I'm astounded by the sacrifice this community in Nebraska gave. It was a time when Americans were truely proud of their country and showed it through respect by giving their time resources and service to others. And in a time with rationing and all together a lot less. Some farm houses didn't even have electricity yet. Reading about the love these people showed and gave to "America's sons", is something I can't fathom in today's society. I found myself tearing up and even crying at times in several parts of this book. It's an impressive patriotic part of US history. You have to admire a town in Nebraska whose townfolk met every troupe train that went through it during WWII. The people were planning to meet the train with their own boys on it, but when that wasn't the case, they went ahead and provided the troupes with treats, coffee, and companionship. That started the tradition of meeting every train because they were ALL their boys. Bob Greene is a newspaper reporter, and he has a very irritating style of writing. I wanted him to spend more time on the pe You have to admire a town in Nebraska whose townfolk met every troupe train that went through it during WWII. The people were planning to meet the train with their own boys on it, but when that wasn't the case, they went ahead and provided the troupes with treats, coffee, and companionship. That started the tradition of meeting every train because they were ALL their boys. Bob Greene is a newspaper reporter, and he has a very irritating style of writing. I wanted him to spend more time on the people and their recollections of the Canteen (those parts of the book are the best), but he kept insinuating himself into the story. Irritating. America in all her glory....when people truly cared for each other. So interesting! My dad recommended this book to me and it was worth the read. An interesting piece of history. Bob Greene is a newspaper columnist and each chapter of this book could have been written for a newspaper column. Someone gave me a copy of the book and I was trying to remember why I was reading it. Our town is reading this book for a "Reads" program and all the local book discussion groups are discussing it in the next month or two. It seems like an odd selection for this because it is non-fiction and he makes a few grammatical errors in the book--not enough to discourage the reader. World War Bob Greene is a newspaper columnist and each chapter of this book could have been written for a newspaper column. Someone gave me a copy of the book and I was trying to remember why I was reading it. Our town is reading this book for a "Reads" program and all the local book discussion groups are discussing it in the next month or two. It seems like an odd selection for this because it is non-fiction and he makes a few grammatical errors in the book--not enough to discourage the reader. World War II is my favorite period in history and I thought I had read about it from every possible angle. Apparently I have not. When WWII started, someone in North Platte, Nebraska came up with the idea of greeting the soldiers who came through with baskets of food. Troop trains stopped for 10 to 20 minutes and the servicemen and women were allowed to get off at this stop. The train depot became a canteen where the local townspeople and people from 125 surrounding communities served food and hot coffee to the troops. There was also a piano in the canteen and sometimes someone would play and people would dance. What is amazing is that no government funds were used. Even though food and gas were rationed, people denied themselves and their families to have enough supplies to feed the troops. Thirty trains a day went through North Platte and the local people met every train that went through for every day of the war and for several months after the war ended as soldiers were being sent home. Some days they served as many as 7,000 people. It seems like an almost impossible undertaking. Each chapter tells the story of a soldier or a local person who was involved in the canteen. The problem is that after a while the chapters become sort of the same. The servicemen and women were extremely grateful and the local people felt privileged to honor the troops. Even so, it is an inspiring book. This book was published in 2002 so many of the people who were interviewed are probably no longer living since they were in their 70's and 80's during the interviews. What was interesting to me is that we learned what happened to some of the soldiers when they returned home. They got married, had a job for 30 years or more, and raised several children. Most of them were married to one spouse for 40 or 50 or more years. I remember only one vet who was divorced. There isn't any mention of vets having PTSD or having physical injuries from the war, although there certainly were some who did. I guess that is why they have been described as "The Greatest Generation." They went to war, even though they were young and scared, did their duty, then they came home and went on with their normal lives. Maybe this is why we continue to romanticize this period in history. I read Once Upon a Town while working on a musical adaptation of it, about which the less said the better. It was pretty impressive to read about so many towns around North Platte putting so much work into creating and maintaining the North Platte Canteen. It was also pretty impressive to hear about the long-lasting memories our servicemen kept of the kindness they found there. It was absolutely stunning to feel the matter-of-factness in the voices of the participants, years afterwards, as they I read Once Upon a Town while working on a musical adaptation of it, about which the less said the better. It was pretty impressive to read about so many towns around North Platte putting so much work into creating and maintaining the North Platte Canteen. It was also pretty impressive to hear about the long-lasting memories our servicemen kept of the kindness they found there. It was absolutely stunning to feel the matter-of-factness in the voices of the participants, years afterwards, as they described planning, organizing, baking, driving, rationing, saving, and dancing. Their view was simple: this was what you do in wartime: not blog toothlessly, self-importantly, not buy a car magnet in the gas station impulse aisle: you wake up at four in the morning to pile into a car and drive forty miles--slowly, because rubber is rationed and your tires won't last--to deliver pies you made with sugar you and your neighbors saved so that a bunch of kids headed off to fight and kill, live if lucky but die if not, could have a brief respite, ten minutes of welcome on their way to the inferno that is war. Cup of coffee, sandwich, maybe a tune on the piano to see them on their way. Some of the popcorn balls they took had a girl's name and address in them so they could write, sounds pretty racy to me! but I don't know from 40's manners. Like many faithful viewers of the History channel, I prefer the less complicated ethics of World War II to the murkier motives of our current wars. Reading about North Platte's less-thriving economy today was depressing, but the past was lively, young and giving. Read this book; it will remind you of what America is supposed to be. Even though we don't hear about it happening so much anymore, I'm sure there are many communities as caring that don't make the news because they're not spicy enough. Look at Operation Iraqi Children! not a peep in the media. Not as juicy as Britney's latest boyfriend. But there is goodness in the world as well as malevolence and apathy. Tremendously interesting story about a Nebraska town that fed every soldier that came through on troop trains for five years. Thousands a day. Incredible dedication to "our boys" which did not go unappreciated. But Greene gets bogged down in what has become of North Platte since the war and the death of passenger trains. I would have liked more info on how the town and surrounding area were able to organize and pull off such a massive undertaking. Both my grandfather and grandmother on my mother's side came froma nearby community. While they had moved to Colodado by that time, their siblings and Aunts and Uncles were the people who were part of this miracle.simple and humble people doing a great thing. It seems almost impossible that a place like this could exist,but it did. I didn't actually finish reading this book. The fundament story of the people of North Platte who met every train carrying soldiers through their town with homemade food, drinks and entertainment during WWII was really cool. The book contained some fun and inspiring stories, but it was a bit too long and got kind of boring. This is my new favorite book. It makes me want to do more for those around me and make my community what this one was during the war years. It is a delightful read. I really needed a book like this as the world around me seems to abound in conflict. What would it be like if we all just cared about each other? Heard the author on NPR. This is a touching story about a town who pulled out all the stops to make soldiers of WWII have something special when the train stopped. Three stars is not a bad review. In fact, I am recommending this to everybody, because it is an uplifting and inspiring story. I'll explain. Bob Greene did a fantastic job of researching for this book. He brought in stories from former soldiers of World War II, went looking for anyone that had ever stopped in the North Platte Canteen. He found the people that volunteered there. He went back to North Platte itself. The story? The North Platte Canteen existed during the war specifically to serve t Three stars is not a bad review. In fact, I am recommending this to everybody, because it is an uplifting and inspiring story. I'll explain. Bob Greene did a fantastic job of researching for this book. He brought in stories from former soldiers of World War II, went looking for anyone that had ever stopped in the North Platte Canteen. He found the people that volunteered there. He went back to North Platte itself. The story? The North Platte Canteen existed during the war specifically to serve the soldiers. Several women came up with the idea, and they were given space to run a canteen. All food was donated. People made cakes, sandwiches, boiled eggs, and coffee. Women, men, and children came from all over Nebraska to help. It was an amazing story of coming together when people were in need. Their efforts touched the soldiers' lives. I didn't give this book four or five stars because it lagged in several places. I think you could get the good parts of this book, skim through the rest, and still enjoy it. Some of the after-story is relevant: what people are doing now, stuff about North Platte, etc. But the random rambling gets a little...well, old, after a while. Robert Bernard Greene, Jr., who writes as Bob Greene, is a journalist.